Argyle Feed Store now has a cattle tubs from Purina that are a great, convenient way to make sure your cattle are getting the protein they need. These cattle tubs are a dietary supplement designed to be fed free choice. These 60 lb. tubs are an efficient way to feed your cattle and can help develop consistency with your feeding plan. This supplement will also help enhance the intake of natural forage among your cattle, while reducing the amount of labor you have to put into feeding your cattle. 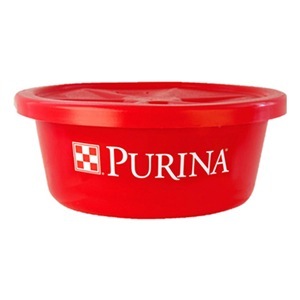 If you would like to learn more about the Purina cattle tubs that we offer, then please click here to view a full nutritional profile of this product. Here at Argyle Feed Store we are committed to making sure you find exactly what you are looking for. If you have any questions about the cattle tubs that we offer, then please click here to visit our contact page. We will be more than happy to answer any questions you may have.